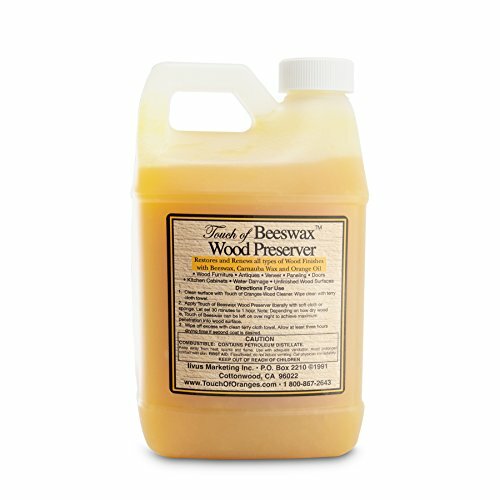 Touch of Beeswax Wood Preserver is a special formula for restoring and protecting all kinds of wood surfaces. 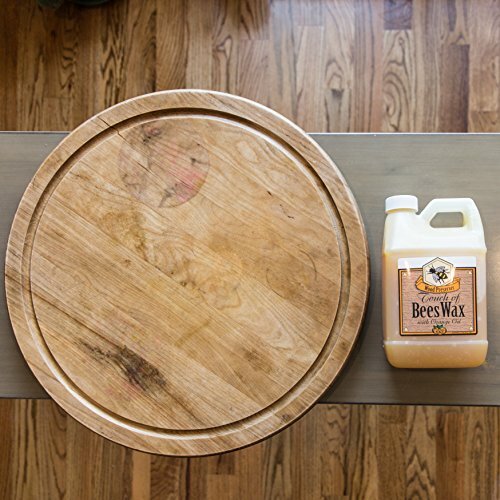 We recommend using the Touch of Beeswax Wood Preserver after cleaning the wood surface with our Touch of Oranges Wood Cleaner. This half-gallon jug of wood preserver can be used on many different kinds of woods. Use it on maple, pine, oak, redwood, and all of your hardwoods. It can be used to restore and protect hardwood floors, wooden tables and chairs, kitchen cabinets, bathroom cabinets, wooden furniture, veneer, paneling, and pianos. Use the product on antique wooden furniture, and witness the dramatic restoration. It can even be safely used on wooden salad bowls and utensils. It can also be used on outdoor wood surfaces, like wooden patio chairs, doors, window frames, small decks, and wood paneling around hot tubs. Touch of Beeswax Wood Preserver can be used to repair wood with sun damage and water damage. You no longer need to look at dingy, dry, and lifeless wood surfaces. This amazing wood preserver will protect, enhance, and guard wood surfaces for many years to come. It can be used both finished and unfinished wood surfaces. When cleaning and preserving most wood projects, we recommend using 0000 steel wool. However, do not use steel wool on high gloss finishes like cherry or mahogany, or on surfaces with a black lacquer finish. Touch of Beeswax Wood Preserver contains beeswax, orange oil, and natural waxes like carnauba wax. 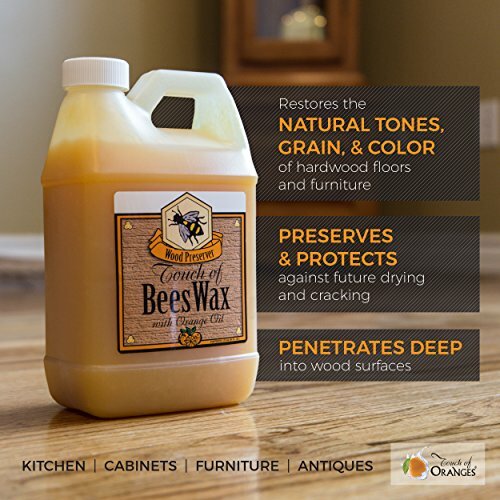 The beeswax in this product gives wood surfaces a natural, silky smooth finish, and it's clear so it won't change the shade of the original stain. The orange oil in this product is a natural and safe alternative to the harsh, toxic chemicals that are often found in other wood cleaners and polishes. It's safe to use around children, and it won't harm your pets. Furthermore, this product is easy on your hands. After using, Touch of Beeswax Wood Preserver leaves behind a pleasant orange scent.